Sailboat access vacation rental property in SE Cape Coral. Minutes away from Caloosahatchee River and the beaches of the SWFL West Coast. The south facing pool area features a large covered lanai with electric heated swimming pool, a oversized boat dock with tiki hut. This is the ideal spot to spend the sunsets with a nice cocktail in hand. The property itself features vaulted ceilings, 3 bedrooms and 3 bathrooms and a den. 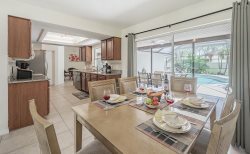 The kitchen features lots of cabinet space and is open to the living room and the outside lanai with lots of natural light. The surrounding neighborhood features mature landscaping and is very quiet as there are no through streets - ideal for walking, running, biking and inline skating. Villa Casa Di Serrento befindet sich im SE von Cape Coral. An einem Segelboot Kanal nur wenige Minuten zum Caloosahatchee River und den Straenden von SW Florida gelegen. Der Swimming Pool Richtung Sueden ausgerichtet und bietet maximale Sonne den ganzen Tag und ist auch elektrisch beheizt. Der Bootsanleger sowie der dazu gehoerende Tiki Hut sind in 2016 komplett neu installiert worden. Das Haus selber hat sehr hohe Decken und viele Fenster fuer natuerliches Tageslicht, 3 Schlafzimmer und 3 Baeder plus Office. Die Schlafzimmer sind mit jeweils einem King und zwei Twin Size Betten ausgestattet. Ueber das Elternschlafzimmer hat man direkten Zugang auf die Terrasse. The washer and toaster needed to be replaced and were within a day. The new dryer was a bonus. Great pool area and close to downtown Cape Coral where a number of great restaurants can be found. Quiet neighborhood on a beautiful canal. Sehr schnelle und nette Kommunikation - fr die nicht englischsprachigen auch in deutsch. Das Haus ist in einer ruhigen Ecke gelegen, schner Pool, alles sehr sauber und gepflegt, groe Betten, vollausgestattete Kche. Die Gastgeber und das Haus sind absolut zu empfehlen, wir kommen gerne wieder! Eva and Bob are wonderful hospitality ambassadors! Location is proximal to everything. Felt very comfortable and right at home here!